The Bear Park Project was completed in 1984. The designed to hold 4000 acre feet of water during high runoff events, reducing flood damages on the Sandhill and Red River. The Verdell Olson Dam began with the construction of a detention dam in the outlet channel from a 50 acre basin. The dam eliminated damages caused by extremely high flows each spring. The proposed Winger Dam was designed to hold 12,000 acre feet creating a lake with 6,000 acrea feet of possible flood storage. After years of effort and expense, the project died due to the inability to obtain proper permiting from the US Army Corp and MN DNR. The project was meant to complement the Winger Dam and provide mitigation for the dam. This project died when the Winger Dam was denied permitting. To complement the district's missions statement, the district supported all efforts to clean our local river. Tires, mattresses, garbage, carcuses, and appliances were just a few things found and removed from our river. The district continues its efforts in 2017! The Sand Hill River Watershed district installed riprap at four erosion protection areas along the Sand Hill River. Three of these areas are located in the vicinity of the city of Fertile in sections 20 and 29 of Garfield Township. The fourth site is located in the NW 1/4 of sect(ion 28, Liberty Township. The City of Fertile petitioned the Sand Hill River Watershed District with a proposed recreational lake west of Fertile at the site of a feed mill that failed in 1950. The project died due to a lack of funding and MN DNR permitting restraints. The Watershed District assisted Garfield Township in 1998 with control structure to lower the lake level of Kurass Lake and establish an ordinary high water level. Multiple agencies planned to develop and restore areas of wetlands that will serve as a "bank" for wetland "credits" to be used to offset damages done to other wetlands for road construction projects. The district discovers a a workable solution for solving the erosion that was occurring at the site in section 31 of Knute Township, Polk County, Minnesota. Since the early 2000's the Sand Hill River Watershed District has collaborated with partnering agencies to restore the Sand Hill River and make it a viable fishery once again. Collaboration between the Red Lake Watershed District and the Sand Hill River Waterhsed District solves flooding for local landwoners. The district cost shares with King Township to maintain the district's policy to manage water through a grass waterway vs. crossing farm fields. The Sand Hill River Watershed District collaborated with many partners to minimize future head cutting along the Sand Hill channel and reduce to occurrence of bank sluffing. The District helps landowners implement erosion control measures in Section 13 of Liberty Township. The SHRWD served as a sponsor for the Mayor's Challenge River Cleanup Program in 1989 which was promoted through the Minnesota Department of Natural Resources. The District extended its efforts by organizing the 1990 cleanup and tree snagging efforts along the natural river channel near the community of Fertile. Groups such as the local 4-H, Conservation Club, Lions and City of Fertile were involved. Over 60 people helped out with donated use of chain saws, backhoes, tractors and trucks along with a picnic lunch served by the local Lions. Additional work in 1991 was completed that improved the recreational use of the stream. The District also coordinated a river clean-up and tree snagging downstream at the community of Climax where the river flows through the City's golf course, a recreation asset in the District. The district plans to continue it's efforts in 2017 to eliminate tree snags that have since been a problem for the waterway. 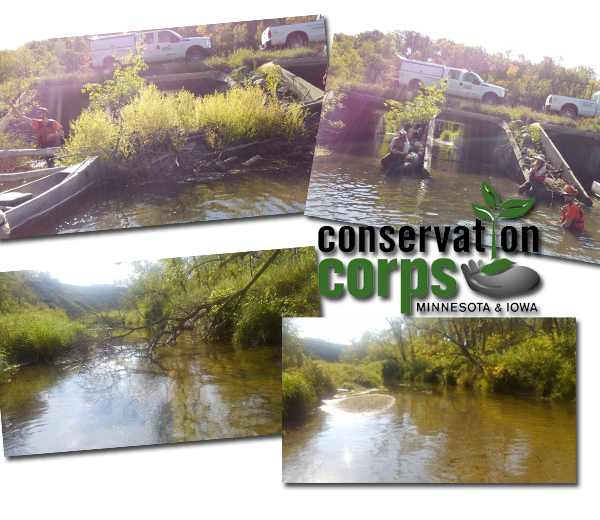 On June 30, 2017, in collaboration with the Conservation Corp using the Adopt a River Program, was a part of the solution! The stretch highlighted in the video, includes the bridge near Allen Erickson's farm East of Fertile and the site known as the "West Mill". The crew eliminated problematic tree snags in that area of the river to keep the river clean and safe for all to use. Additionally, in 2017, the Legislature directed the Board of Soil and Water Resources (BWSR) to appropriate $500,000 of the Clean Water Fund to be contracted for services with Conservation Corps Minnesota. BWSR contracted with the Corps to provide funded labor to cities, counties, soil and water conservation districts, metropolitan watershed management organizations, watershed districts, and joint powers organizations of those government units to undertake projects consistent with the Corps mission, BWSR grant policies, and Clean Water Fund goals (Laws of Minnesota, Chapter 172, section 6). Funds were available for Conservation Corps crew labor only, on projects with the purpose of protecting, enhancing and restoring water quality in lakes, rivers and streams and/or protecting groundwater and drinking water sources from degradation. Project proposals should demonstrate measurable outputs to achieve water quality objectives through the implementation of best management practices. In 2017, the district was notified that they were the reicpient of this grant awarding 1500 hours of crew labor and work began in the fall of 2018. The crew began at the location known as the West Mill site, west of Fertile, and extended all the way through to Polk County # 44. The crew cleaned large abounts of debris obstructing the river and garbage found from pollution.